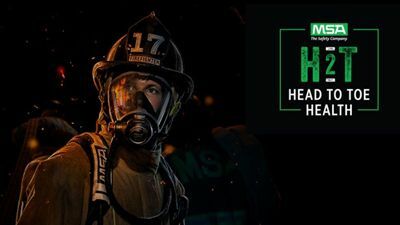 PITTSBURGH — At MSA (NYSE: MSA), health, safety and well-being are what drive us to not only develop technologically-advanced safety equipment to help protect firefighters on the job, but to advocate for their overall head-to-toe health. That’s a major reason why MSA awarded 30 firefighters with scholarships to an O2X Human Performance Workshop – the first of which is taking place this week in Champaign, Ill. The O2X Human Performance Workshop is designed to help firefighters start, stay and finish their careers strong. Wherever firefighters are in their health, wellness, and safety journey, MSA wants to help maximize performance by offering firefighters the chance to participate in this life-changing, physical and mental health optimization program. While the first scholarship sponsored workshop is this week, two additional sessions are planned for Miami, Fla. and Austin, Texas November 13 – 16. “Working with firefighters is extremely inspiring,” said Adam La Reau, co-founder of O2X and a former U.S. Navy SEAL. “We are fortunate to have the opportunity to help these men and women thrive and to partner with MSA, who shares our mission and is seeking ways to protect firefighters both inside and out." To learn more about MSA’s longstanding commitment to enhancing firefighter health and safety, please visit www.msafire.com/H2Thealth. Established in 1914, MSA Safety Incorporated is the global leader in the development, manufacture and supply of safety products that protect people and facility infrastructures. Many MSA products integrate a combination of electronics, mechanical systems and advanced materials to protect users against hazardous or life-threatening situations. The company's comprehensive product line is used by workers around the world in a broad range of markets, including the oil, gas and petrochemical industry, the fire service, the construction industry, mining and the military. MSA's core products include self-contained breathing apparatus, fixed gas and flame detection systems, portable gas detection instruments, industrial head protection products, fire and rescue helmets, and fall protection devices. With 2016 revenues of $1.15 billion, MSA employs approximately 4,300 people worldwide. The company is headquartered north of Pittsburgh in Cranberry Township, Pa., and has manufacturing operations in the United States, Europe, Asia and Latin America. With more than 40 international locations, MSA realizes approximately half of its revenue from outside North America. For more information visit MSA's web site at www.MSAsafety.com. O2X is the world leader in human performance training and education for firefighters, first responders, military personnel, elite organizations, and other tactical athletes. O2X provides comprehensive, science-backed training and education so tactical athletes can finish their careers as strong as they started. The results driven O2X EAT SWEAT THRIVE curriculum encompasses all areas of human performance: nutrition, conditioning, sleep, stress management, and resilience. The O2X team is comprised of U.S./UK Special Operations veterans, Olympic, professional, and All-American collegiate athletes, and 70+ human performance experts who teach the latest cutting-edge research in each of the primary fields of health and wellness. Request more product info from MSA Safety.